We hope that everyone has been having a wonderful spring. It's been beautiful down here on the Baja with night time temps in the 50s and 60s and highs in the low 80s with low humidity. We rarely see clouds, so you really have to be good about applying sun screen. The water is finally starting to get warm enough to play in too. Both the air and water temps are quite a bit cooler than when we were hear last year. I'm clearly getting into the cruising mind set as I'm having a hard time remembering what day of the week it is and the tan line where my watch went has basically disappeared. Basically my thoughts are: What are the winds and waves doing? ; Is it light out? ; and Am I hungry? The day of the week and time really don't matter. Right now we're in La Paz, Mexico, which is a fabulous city, but that will be a separate log and I need to get caught up on the fantastic places that we've been at since my last log. When I last wrote we were in Agua Verde and where I got to see a horn shark, which was new to me. 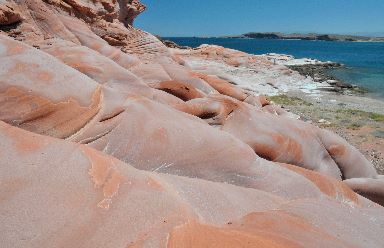 From there we moved to Los Gatos, which is basically an anchorage with stunning red wind-sculpted sandstone cliffs. We stopped here last year to enjoythe view and clamber around on the rocks and tidal pools, but it still didn't stop me from going "Wow!" when I'd turn around and see them from a different view. Last year we regularly saw whales, but this year we haven't see many, however on this passage we saw a Humpback or a Blue whale along the way. We've seen others, but this one was the closest one yet. We've also seen many huge pods of dolphins hunting fish. It's quite amazing to be in the middle of the pods and believe me, you wouldn't want to be a fish in the area! From Los Gatos we moved 38 nm to Isla San Francisco which has a beautiful crescent shaped bay which is very well protected from all directions other than the SW. There's a great hiking trail that takes you along the eastern ridge and provides great views of the bay and 300' straight down to the ocean. Last year we anchored on the E side to escape nightly SW winds known as Coromuels, but that didn't work out well as an easterly swell developed and we rocked and rolled all night and were out of there at daybreak. The boats that were within the bay were nice and smooth, so we decided not to make that mistake again, so we anchored in the bay. Well, guess what appeared starting at o-dark:thirty? Ah yes, the corumuels and we rocked and rolled until we got up headed to our next anchorage. We haven't had good luck with Isla San Francisco. From Isla San Francisco we headed about 25 nm to Isla Partida, which is the small northern sister island to Isla Espiritu Santo. 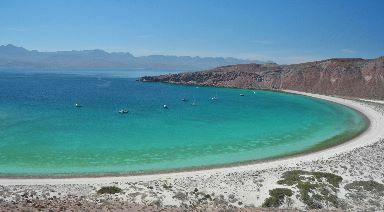 These islands are close to La Paz, which make them very popular destinations for people who keep their boats in La Paz. Both of these islands have beautiful deeply indented anchorages lining their west facing coastlines. The water is a stunning turquoise color due to white sand that you anchor over. The color contrast between the water, brilliant white beaches and the pink/green/brown striated rock cliffs is truly breathtaking. The biggest problem is that the anchorages are open to the coromuel winds which appear on many nights. One can only image that these anchorages were carved over the millennia by these persistent wind and waves grinding away at the rock. Despite a forecast for light SW winds, the coromuel winds appeared around midnight and gusted up to 25 kts throughout the night and well into the morning. We were anchored about 150' in front of a rock wall and you could hear the waves breaking right behind us. I really hoped that we didn't drag and nothing in the anchor tackle would fail. It didn't, but it certainly wasn't my favorite night at anchor. We've been traveling with M/V Orion on our way to La Paz. They're wonderful people and we really enjoyed getting to know them. We've been "enjoying" the same anchorages and discussed where to go next. 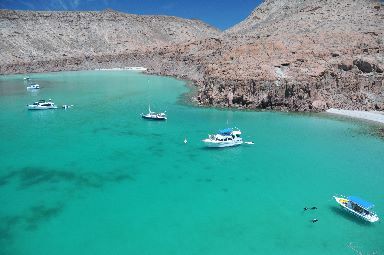 We both came to the same conclusion that the anchorages between Isla Partida and La Paz were open to the SW and based upon what we were seeing, that none would be good anchorages, so we both headed into La Paz. Based upon the winds that we had that night, it was a GREAT decision and I slept for about 10 hours that night, which is huge for me. I guess that two nights of poor sleep can do that. We'll be in La Paz for 8 days as there's a cruisers festival called Bay Fest going on and this is a great place to hang out for a while. But I'll stop here as this is plenty long and I need something to write in my next log! 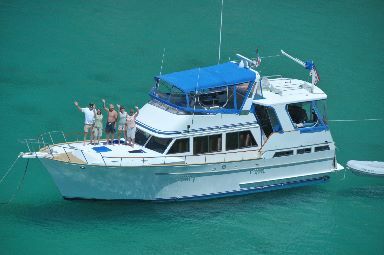 At Isla Partida we anchored in Ensenada Grande at about 24-33.5N W110-23.87W just below the cross in 12' over sand. At Isla San Francisco we anchored at 24-49.30N 110-34.16W in about 15' over sand. At Puerto Los Gatos we anchored at 25-18.25N 110-56.77W in 17' over sand.